I am not about to use this forum to promote my politics, but this picture I snapped with my phone today goes beyond political boundaries. 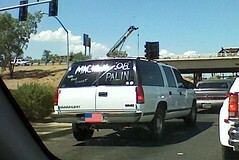 If you are going to show that kind of commitment to your party, spell your candidate’s name right. One part barrel racing, one part, uhm, shooting balloons with .45 caliber pistols, and one part cosplay. And it all started here in the valley. I love Cowboy Mounted Shooting. It is staged on a rodeo field, with poles arrayed in a pattern. Day laborers run onto the field with brightly coloured balloons that they place in the poles. As they run off a contestant begins the course. They must travel around and shoot ten ballons, switching pistols or something. No Sigs allowed, I guess. I have seen barrel racing before at fairs and it is fun, very exciting. But I guess something was missing after all cause with the balloons and the shooting it becomes the most amazing spectacle I have ever seen. It truly does. See for yourself at an upcoming event. Counting down the top 30 things I love about living here as we head towrds our first anniversary of blogging here at MBP. Come to think of it what could not be improved by adding balloons and shooting them. Think how much more fun NASCAR would be, or soccer. Even I would watch that.